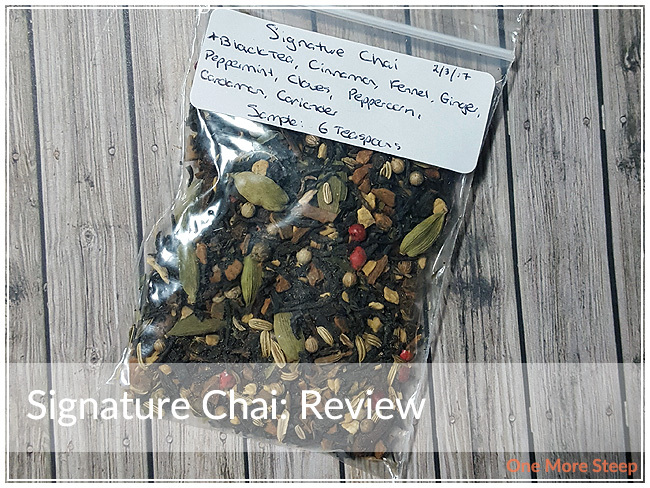 The Key of Tea has provided me with ImmuniTea for the purposes of providing an honest review. I received this product at no charge to me and received no other compensation. 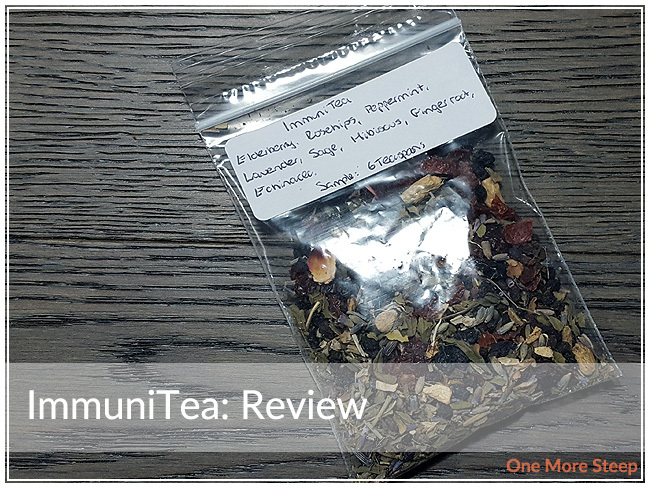 ImmuniTea has an excellent punny name and the Key of Tea’s website states that this blend is of immune-boosting herbs. 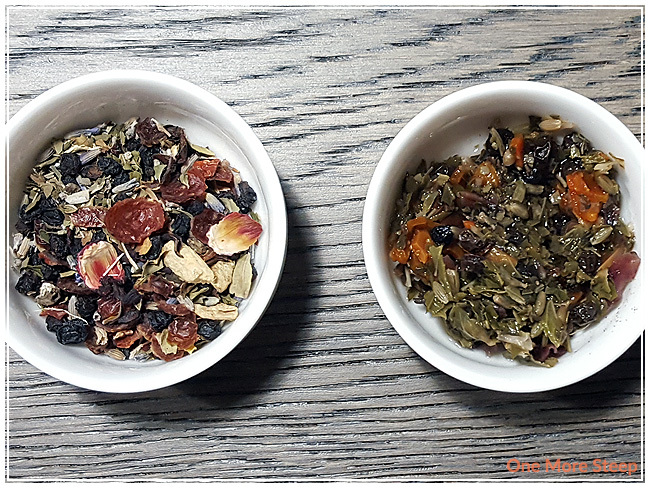 ImmunitTea consists of: elderberry, rosehips, peppermint, lavender, sage, hibiscus, ginger root, and echinacea. The ingredient that really stands out the most to me when smell the dry herbal blend is the ginger. Ginger in general can be a pretty strong ingredient, so I’m not surprised that it overpowers the other ingredients before it’s been steeped. It’s a very pretty blend though, I love how I can see the individual ingredients in the blend. The Key of Tea’s website didn’t have any preparation recommendations for ImmuniTea, I used boiling water (100°C/212°F) and steeped it for 5 minutes. 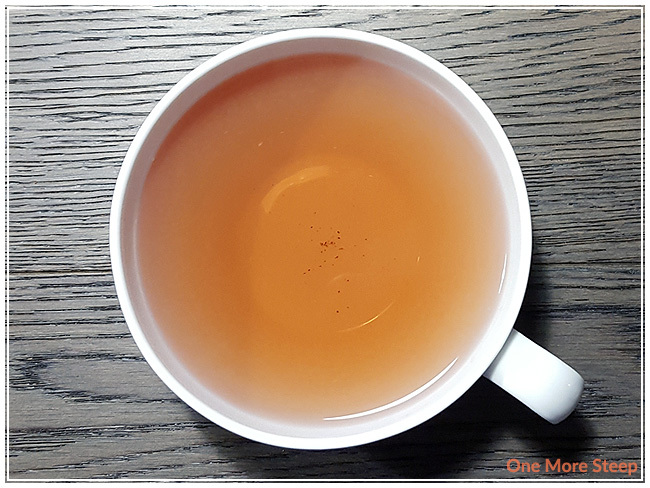 ImmuniTea steeps to a very pretty reddish-orange. 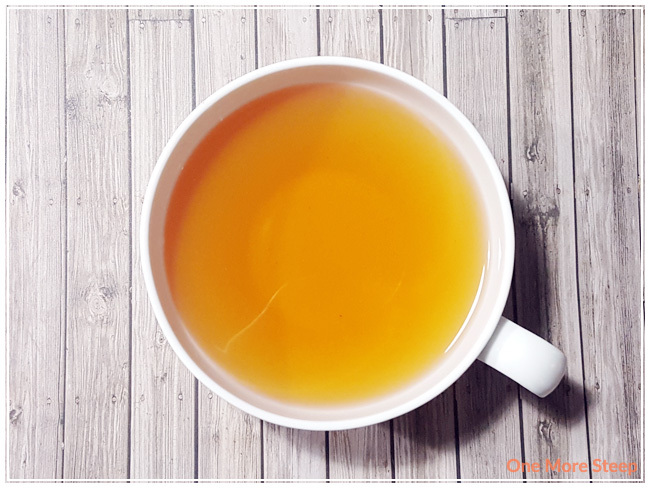 I love the smell of it as I poured it into my tea cup – the smell of ginger, lavender, and peppermint wafts up to me and it just puts me into a really good mood! There’s just something about it that smell delicious and inviting. On first sip, I note that ImmuniTea has a light sweetness. There’s a strong ginger flavour, with a freshness at the end of each sip. I found that the combination of ingredients makes for a nice warming sensation. I resteeped ImmuniTea twice with an additional 30 seconds for each subsequent steep. I found the first resteep was a bit milder than the first, and the second resteep wasn’t as good. I think that ImmuniTea is good for a total of two steeps. 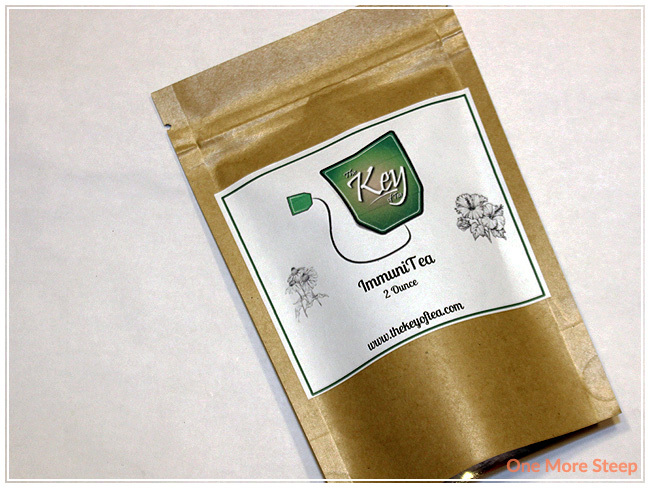 I loved The Key of Tea’s ImmuniTea. The warming sensation was a delight, thanks to the ginger. I loved the freshness at the end of each sip, that I attribute to the peppermint. 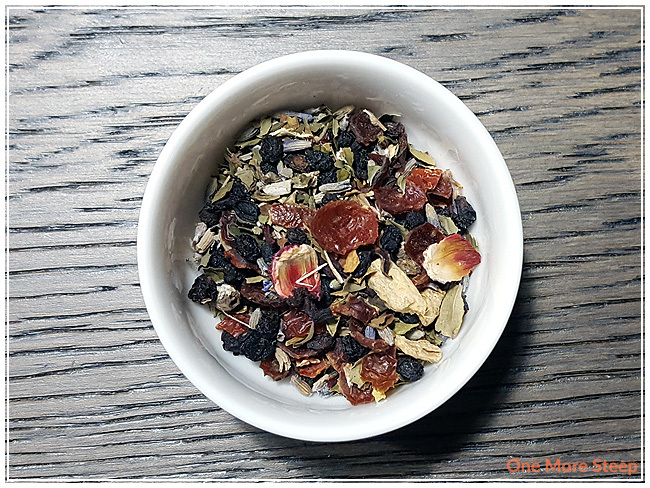 The sweetness of this herbal blend adds a little extra something to it, and makes it a tasty delight. 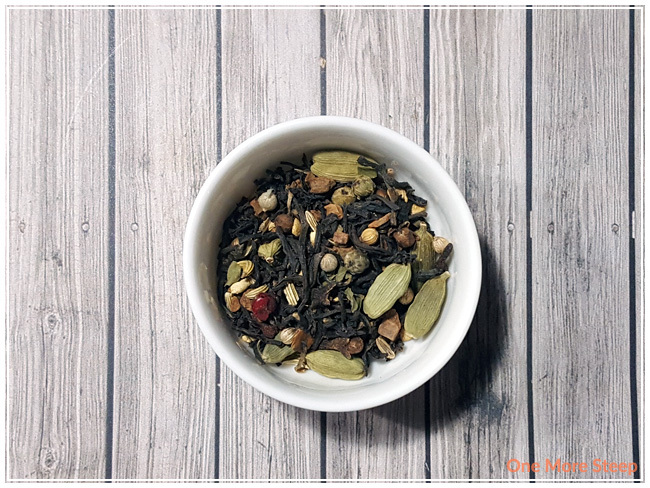 It’s a good blend of herbal ingredients and I do enjoy a good herbal tea from time to time because the lack of caffeine means I can drink it at 9pm and not feel energized all night long. 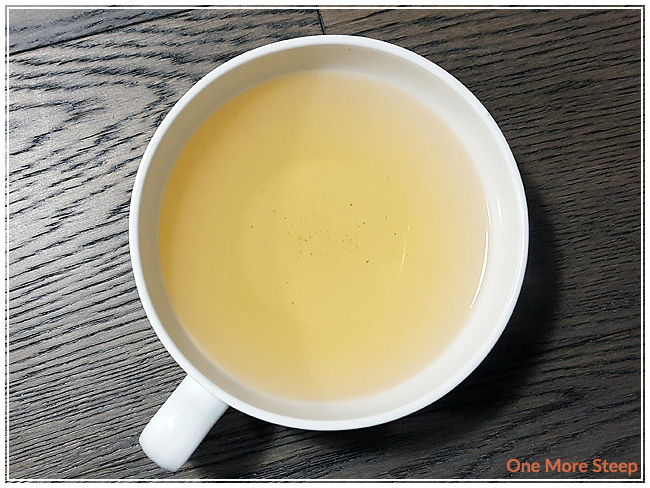 The ginger is the strongest ingredient in the dry leaf and steeped tea, and it’s just so good and works well as a pick-me-up. 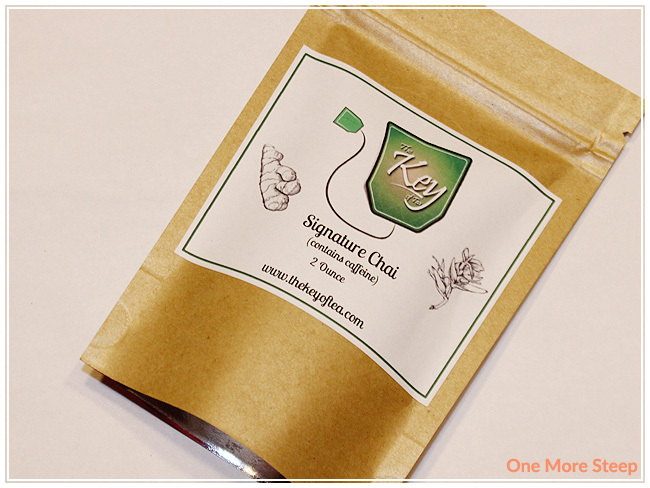 The Key of Tea has provided me with Tummy Love for the purposes of providing an honest review. I received this product at no charge to me and received no other compensation. 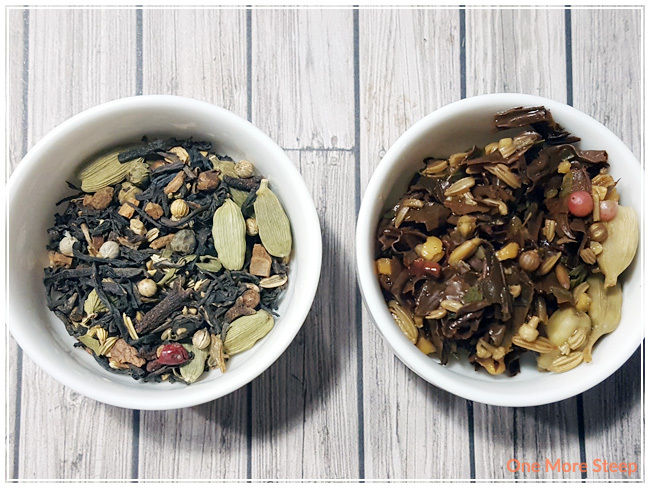 The Key of Tea describes Tummy Love on their website as being a “warming blend of herbs and spices to aid in digestion” and looking at the list of ingredients I can see why that might be the case! 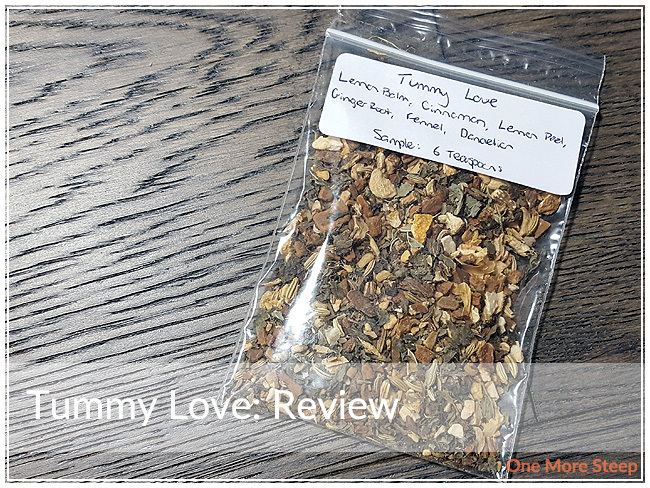 Tummy Love is an herbal blend that consists of lemon balm, cinnamon, lemon peel, ginger root, fennel, and dandelion. When I opened the sample bag, I can definitely smell the lemon, ginger, and cinnamon. I can’t really make out the fennel or dandelion in the aroma of the dry leaf, but I can see them and I’m not surprised that I can’t smell them with the strong fragrances of the other ingredients. It looks lovely though, and I can see the different ingredients which is quite nice. There weren’t any steeping instructions on the website or packaging, but Claire of The Key of Tea recommended steeping the tea at minimum 5 minutes. I steeped Tummy Love in boiling water (100°C/212°F) for 5 minutes for the initial steep. Tummy Love steeps to a really nice yellow colour, it reminds me of sunshine in a cup and it’s just very cheerful. 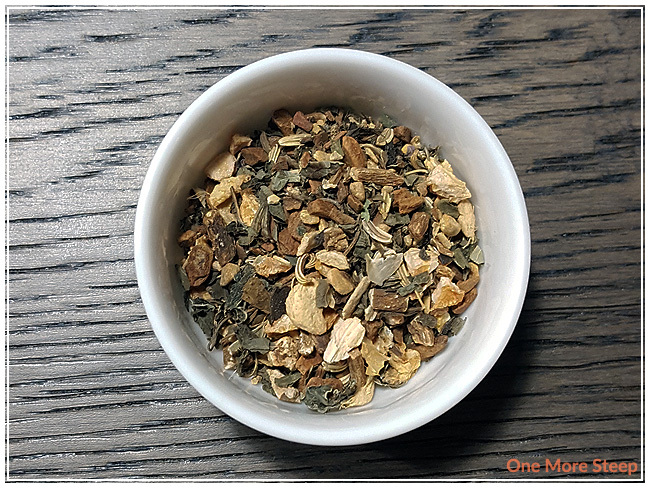 The herbal blend has a strong lemon and ginger aroma to it after it’s steeped, it smells quite inviting. On first sip, I’m surprised that the lemon isn’t as strong as I had expected. The ginger flavour is the strongest out of all of the ingredients and it’s the first thing that I notice when I drink it. I love the strength of the ginger, it has a great warming quality about it that I appreciate from ginger. I did add some honey to the tea to see how it would do when sweetened. I found that Tummy Love did great with the honey – the ginger was more toned down, and it tasted like candied ginger, and the other ingredients were able to come out when the ginger was toned down so I could taste the lemon and cinnamon. 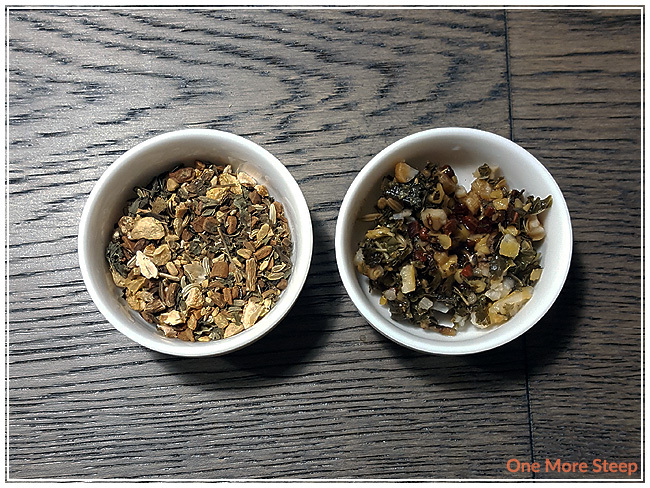 I resteeped Tummy Love a total of three times – I found that the first two resteeps were quite good and had great flavour, the herbal blend was tapped out of flavour by the third resteep, so I would say that Tummy Love is good for two resteeps. With my usual steeping pattern, I added an extra 30 seconds per additional steep. 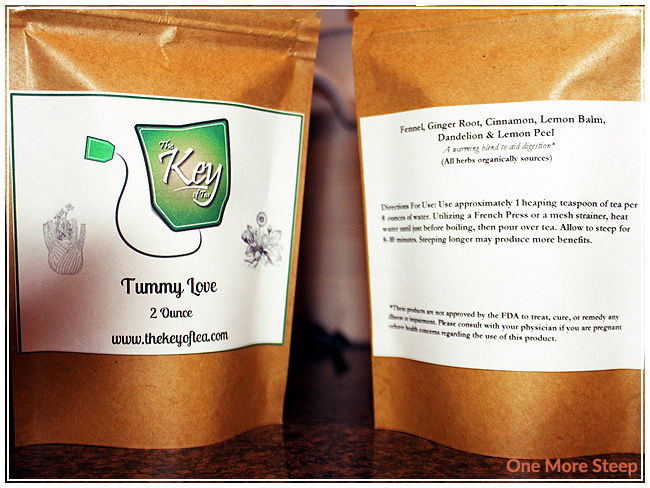 I loved The Key of Tea’s Tummy Love. I found that the herbal blend smells delicious, and I really liked the ginger flavour. I found it did great with the addition of sweetener, and the honey did help to temper the ginger and let the other flavours shine through. That sad, Tummy Love is great without sweetener and has a really nice, strong ginger flavour.